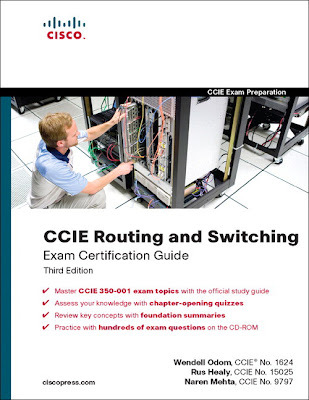 CCIE Routing and Switching Exam Certification Guide, Third Edition,is a part of a recommended learning path from Cisco that includes simulation and hands-on training from authorized Cisco Learning Partners and self-study products from Cisco Press.It is best of breed Cisco exam study guide that focuses specifically on the objectives for the CCIE Routing and Switching written exam. Senior instructor and best-selling author Wendell Odom shares preparation hints and test-taking tips, helping you identify areas of weakness and improve both your conceptual knowledge and hands-on skills. Material is presented in a concise manner, focusing on increasing your understanding and retention of exam topics. 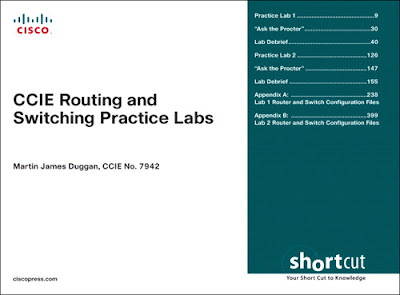 CCIE Routing and Switching Practice Labs (Digital Short Cut) presents you with two full lab scenarios in exam style format to echo the real eight-hour CCIE Routing and Switching lab exam. This publication gives you the opportunity to put into practice your own extensive theoretical knowledge of subjects in isolation to find out how they interact with each other on a larger complex scale. An “Ask the Proctor” list of questions for each section helps provide clarity and maintain direction to ensure that you do not give up and check the answers if you find a task too challenging. After each lab, this Digital Short Cut lets you compare configurations and routing tables with the required answers. You also can run through a lab debriefing, view configurations, and cut and paste configs into your own lab equipment for testing and verification. The point scoring for each question lets you know whether you passed or failed each lab. This extensive set of practice labs, which sells for hundreds of dollars elsewhere, helps you make sure you are fully prepared for the grueling CCIE lab exam experience. 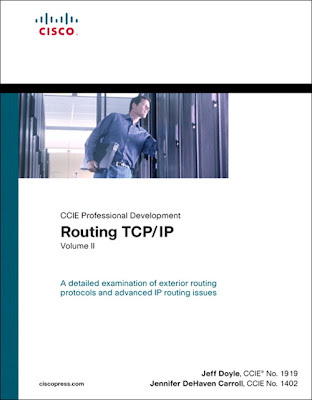 This new edition provides readers a deep understanding of IP routing protocols, teaches how to implement these protocols using Cisco routers, and brings readers up to date protocol and implementation enhancements. 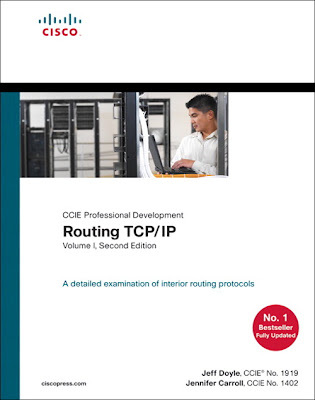 Routing TCP/IP, Volume 1, Second Edition, includes protocol changes and Cisco features that enhance routing integrity, secure routers from attacks initiated through routing protocols, and provide greater control over the propagation of routing information for all the IP interior routing protocols. It provides a detailed analysis of each of the IP interior gateway protocols (IGPs). Its structure remains the same as the best-selling first edition, though information within each section is enhanced and modified to include the new developments in routing protocols and Cisco implementations. The complexities of exterior gateway protocols, including TCP connections, message states, path attributes, interior routing protocol interoperation, and setting up neighbor connections, require a comprehensive understanding of router operations in order to manage network growth. Routing TCP/IP, Volume II, provides you with the expertise necessary to understand and implement Border Gateway Protocol Version 4 (BGP-4), multicast routing, Network Address Translation (NAT), IPv6, and effective router management techniques. Jeff Doyle’s practical approach, easy-to-read format, and comprehensive topic coverage make this book an instant classic and a must-have addition to any network professional’s library. As the Internet continues to grow exponentially, the need for network engineers to build, maintain, and troubleshoot the growing number of component networks has also increased significantly. IP routing is at the core of Internet technology and expedient troubleshooting of IP routing failures is key to reducing network downtime and crucial for sustaining mission-critical applications carried over the Internet. Though troubleshooting skills are in great demand, few networking professionals possess the knowledge to identify and rectify networking problems quickly and efficiently. 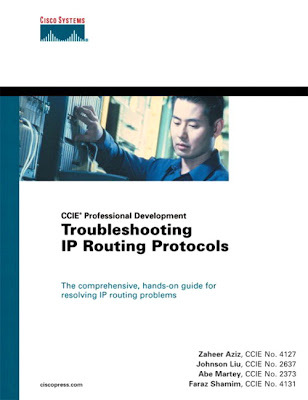 Troubleshooting IP Routing Protocols provides working solutions necessary for networking engineers who are pressured to acquire expert-level skills at a moment’s notice. This book also serves as an additional study aid for CCIE candidates. Anyone hast the CCIE RS v5 e-books for both certification and lab guide? i have CCIE RS V5 e book you can download it on the pirate bay torrent. These downloads have been tracked, have a nice day. Please , the link for Official Cert Guide version 4 link is not valid. These are wonderful resources for CCIE but it seems like all links are not working. Can you please re-upload or re-post new links? Thanks. The CCIE Routing TCP/IP, Volume II link is not valid anymore. Could someone update the link or provide a new one? Hello, everyone i have studied ccnp and i have some books i dont know that these books are updated or old please send the Cisco CCNA, CCNP and CCIE new 2012 books. CCIE Routing and Switching v4.0 Configuration Practice Labs (ebook), 2nd Edition link is broken. Please renew it. After some time spent to find this book i decide to ask help. This is new book so if you open new GB for this book i will join and buy. This book with configs so they need too. I already loaded to 4shared. link say no dir found on hotfile.com how we can prepare know ? Is there anybody having *** CCIE Routing & Switching Written Exam CoD videos to share? Did u get that.. If so i reqest u to pls share..
your tcp/ip volume 1 2nd edition book link is downloading as a .CHM file and both my adobe and foxit reader cannot open it. Can any one please recommend which book need to study for R&S written exam. There is so many books uploaded here >> And in the written exam, Does it has any simulation questions?? Or everything is multiple choice.??? Hi,can u please provide different link for “CCIE R&S Certification Guide, 4th Edition” other than rapidshare.I am unable to download from both the CD ROM and link from rapidshare. Ok, I will upload to a mirror. I am going to give CCIE R&S theory exam on 28th sep. Would you please tell me which is the latest dumps.Which can help me to pass the exam. I could arrange a Group buy for this book. Will post the detailed info within 24 hours. * By Martin J. Duggan. * Published by Cisco Press. Hi Guys, for CCIE SEC written exam, p4s with 338 questions is still valid? it's R&S. not the security. which CCIE you passed? security? Thank you career cert for all the useful stuff you provide. I passed CCIE written exam yesterday with 921 marks. Which one ? I've checked all links. 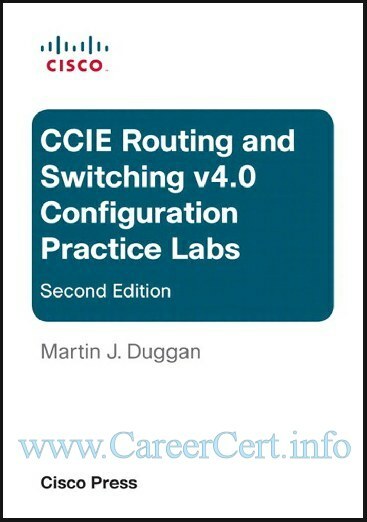 hi there,cisco press launched CCIE Routing and Switching v4.0 Configuration Practice Labs.any chances to download the book in pdf format.thanks. Hey careercert… Thanks alot, ur really helping us. May God bless u always! 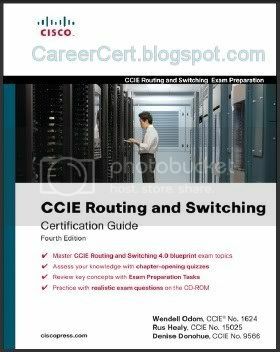 Careercert, can u please post a link to download CCIE IPexpert version 4 study material. Thanks. I am a CCIE wanabee. Thanks for your effort. man… about the CCIE 4th edition, cd-rom. IT asks for an activation key to download the practice exams, do you know where i can find it? Thanks man! 1. Yep !..These books are sufficient for the study part of lab. For the preparation part i suggest to practice from some workbooks. Lab exam is not easy at all…specially the new v4. 2. [email protected] is my verified paypal account ID. I made this when i was using hotmail. Later i realized that hotmail is not sufficient for my needs. So i switched to gmail. I have made all my hotmail and yahoo mails forwarded to gmail. 2nd thing,when i m going to purchase dumps,it's showing [email protected] & you r reachable in [email protected],please clear my confusion. CD-ROM link has been added for "CCIE R&S Certification Guide, 4th Edition"